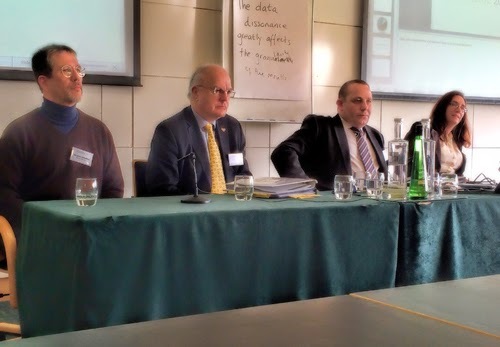 We were recently enticed to visit Cambridge, England, by the interesting program of the first Stridonium Conference. Anyway, the conference was a good excuse for visiting a bit of England that we had never visited before: we were especially keen on seeing both Oxford and Cambridge. The event was held at the Møller Centre of Churchill College: a particularly pleasant environment for such a cozy conference, that was intended as a meeting of both translators and people from the world of business and foreign affairs. There weren't many participants at this first Stridonium conference, but the group, though small, was diverse. There were translators, teachers of translation from several different universities, a few students, some translation company representatives, and people from the world of foreign affairs and business. Andrew Wood, a solicitor specialized in advising Dutch companies that want to do business in Britain, or British companies that want to operate in the Netherlands, gave a presentation about the importance of being aware of different communication styles when conducting negotiations, as well as various potential problems when translating from a common-law country (such as England) to a civil law one, such as the Netherlands. Susannah Poulton, culture and language adviser for UK Trade and Investment, mentioned the difficulties of providing advice to small companies that want to do business abroad, but that don't understand the necessity of planning any translation and language work well in advance, and asked for advice about how to persuade such small businesses that translation, and especially well-planned translation, is very important for succeeding abroad. Charles Grant, a foreign policy expert, talked about the real possibility (worst case scenario) that Britain might leave the EU after 2017, following a referendum, and how that might actually finally trigger the secession of Scotland from the UK (and subsequent application of Scotland for EU membership). Sir Colin Budd, a retired diplomat and former UK ambassador to the Netherlands, explained why language is key to effective diplomacy, the importance of knowing language and cultural nuances for both diplomats and translators, and how for diplomats (and of course for the translators that help them communicate), knowing, for example, how to be consciously ambiguous is sometimes essential. Jeff Heasman, an expert in international business communications, addressed the danger of "Chinese whispers", that is, the danger of unintended bad communication due to the difficulty of understanding overly verbose or complicated documents, advocating instead the use of plain English. Christina Guy spoke briefly on the importance of "getting language right", that is, not fall into some of the blunders that amuse translators and cost business real money. The conference ended with a four-person panel (consisting of Mr. Wood, Ms Poulton, Jeff Heasman and myself), which fielded questions from the attendees on various aspects of international translation. All in all, a pleasant conference, well organized and interesting, well worth going. It is hopeful to see a translation conference with actual translation users in attendance. I'll be following Stridonium from now on. Thanks, Riccardo.